Reading’s favourite GP Surgery celebrates ‘outstanding’ rating . Staff at the University Medical Centre on Northcourt Avenue in Reading were celebrating this week as they were awarded an ‘outstanding’ rating by the Care Quality Commission, the OFSTED equivalent for the health service. The practice, already voted Reading’s favourite by patients in the annual NHS survey, was visited by the Care Quality Commission on 28th January but the outstanding confirmation has only just come through from inspectors. 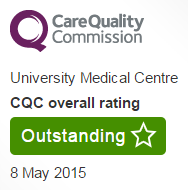 Less than 7% of practices inspected so far in England to been awarded this prestigious rating. The inspectors talked to many staff and patients during their visit to hear first hand their views of how the practice was run. The practice is the largest in Reading and registers people living in the local community as well as students; the inspectors commented on how medical care for all was pro-active and well managed.